In a year, give or take a bit, I am thinking about taking a long term auto tour of the USA. My “home base” would be wherever I happen to have stopped driving at the time so I would be processing photos on the road. I'm not planning on camping (much) so I will have access to power and hopefully wi-fi. Right now I am using a 9 year old desktop, a Dell Studio XPS 435MT which has a first generation i7 processor. I have upgraded memory to 12 GB and installed a 2 TB hard drive but that's about it. Oh, I also upgraded from Vista to Win 7, and then Microsoft kindly upgraded me to Win 10… I'm learning to live with it. But, now my computer has started making noises—never an inspiring situation. I'm not sure it is a drive problem because even while making the noise (kind of a screeching friction sound plus a bearing rumble) I checked drive status with wmic and got a string of OKs. This computer model has a history of fan problems so it could be that, but I still decided to do a hard drive backup. Following that, the noise predictably stopped for a couple of weeks but it just started up again, intermittently today. So, I am about due for some new hardware. Since I expect be traveling a laptop would probably be the best bet. I may have room for my Dell U2412M monitor but I would want a decent screen on the laptop. Probably a recent i7 processor as well. I do have a laptop but it is probably 4-5 years old with a 3rd generation i5 processor and the screen isn't very good. So I would be shooting for one computer to replace both my antique desktop and the laptop. I did read the last “what laptop should I buy” thread but it is over 2 years old so I thought I would revisit the question. I don't really want to spend $3K, but I am willing to spend enough so that I'm not wishing for new hardware in a year. I only process photos for my personal use. I do expect my photo volume to go up during my travels, but not to professional levels. So speed really isn't important except that it drives me crazy watching that circle go round and round. I do want to improve processing speed for my sanity's sake. Right now I am using Lightroom 6.13 standalone with an occasional jump into Photoshop CS6. But if I get to the point that I need newer post processing software I may switch from Adobe rather than go with the subscription (a subject for a different thread at another time). For right now I get what I need from my versions of Lightroom and Photoshop. I only edit photos, no video. Otherwise I will use the computer for web browsing, document generation (probably a free Office alternative program) and maybe a few games that are not video intensive. I may also use it for Skype and possibly streaming some videos. So, if anyone has any suggestions for laptops, preferred brands, how they should be configured, or anything, I am interested. Except, I am not interested in switching to Mac. Old dog and all that. I am using a Lenovo Yoga 720 which is both a laptop and a tablet if you fold the screen backwards. It has a beautiful 15.6" 4K touch screen, 256GB SSD drive (but you can get up to 1TB SSD), i7 2.80GHz processor, 16GB RAM, 2GB 1050 Nvidia GeForce Graphics, up to 10 hour battery life (on battery saver mode), 4.4lbs. I paid a lot more for it than what you would be paying for it today. I paid $1,600 for mine, but now Lenovo is selling the 15" 1920 x 1080p for under $1,000 with the 256GB SSD! This is the one I have: https://www3.lenovo.com/us/en/laptops/yoga/700-series/Yoga-720-15/p/88YG7000828 If you pick the 4K screen, it's going to cost a bit more, but worth the upgrade. I would second the Lenovo recommendation, but I would be careful about their consumer oriented lines. I've been using the ThinkPad W line for the past 10 years and they're solid machines--great keyboards, lots of ports and good screens. They aren't thin and light however, so the W line is not ideal for travel, but there are other ThinkPad models to choose from. You can often get good deals from them on older models which are perfectly capable machines but not the latest and greatest. I'm not familiar with the current offerings, but based on my last purchase, I'm guessing that you should be able to satisfy your needs for somewhere between $1.5 and $2k. Thanks @Dyun and @Richard for the Lenovo suggestion. The Yoga looks appealing from a portability perspective. I do hope to do some overseas travel as well and that would be much easier with a lightweight system. But, while I will have a well padded case of some kind and will make sure the case is well secured, I am concerned that the lightweight system will not be as durable. Also, I have used a Microsoft Surface Pro (both with and without an add on keyboard/cover) and I found the small form factor to be somewhat difficult. The Yoga does look to be somewhat bigger and more computer like so it may be OK. I think I would have to find someplace to try it first before I would be convinced that a 2 in 1 will give me the feel I want. I would want to make sure that the keyboard spacing will allow easy typing. Lenovo does have a good reputation and they were on my list of possibilities. I have also read some good things about the Dell XPS 15 series. That was one of the selected models in the 2 year old thread. I've read a lot of online articles about laptops for photo processing and they all seem to recommend something different. Surprise. But I've decided a few general things based on what I've read. As far as configuration goes, I want an IPS display, probably 4K. I'm on the fence about Windows 10 home vs. pro. The main thing about the home version that bothers me is the automatic updating. I left my computer for a few minutes (getting sidetracked turned it into an hour) and came back to find a rebooted machine. Most of my programs save my work automatically, but it bothers me. Maybe not enough to spring for pro, though. SSD or large hard drive? -Monitor size: I'm thinking 15” but would a 14” OK? -How much memory? Should I get 16 GB or should I go for 32? -Separate graphics processor? If so, what is recommended? -Go all out for the 8th generation i7 or save some bucks with the 7th generation? I'm leaning toward the 7th generation i7 with 16 GB of memory. I'm also thinking of a 512 GB solid state drive. I would work on current photos on that drive and when done move them to an external drive, backing up the external drive and working folders. I'm also thinking of doing online backup as well. Is there any other hardware or software I should consider for processing on the road? I already have the Spyder 4 Pro. I currently have a couple of Seagate Backup Plus 4TB drives and a WD 2TB drive that is a larger desktop version. I have never used a digitizer pad for my processing, but maybe it's time for a change in that regard as well. Hey, I may as well get everything I will need all at once. Any suggestions about the computer or associated hardware/software are welcome. Thanks. That sounds about right. SSD is much faster than spinning platters. You always pay a premium for the latest generation CPU and for most purposes (including photo processing) it's just not worth it. I hardly ever see my CPU at 100%. A discrete graphics processor is desirable, though unless you're a gamer (or Bitcoin miner) a low end card is probably sufficient. I have 16 GB of RAM and never see swapping, so that's probably good enough. However, you might want to make sure that the machine can be upgraded to hold more memory in the future. Mine can take 32 GB but none of the software I use needs that much. One doesn't know what the future holds, but it's unlikely that we'll need less memory. I should add that all of these recommendations are based on only doing photos, not video. Video is much more demanding on all components. Online backup is a good idea but it should not be your first line of defense. Bandwidth can be unpredictable on the road, so your best bet would be to sync your external drive backup to the cloud periodically. Check to see whether your external drives can accept the highest speed your new machine supports--your backups are only as fast as the slowest link. A nine year old external drive might not even be USB 3. One final suggestion is to consider using a wireless mouse instead of a trackpad or touch screen--the extra precision really comes in handy for doing selections and paths in PS. A pen tablet is even more precise, though the ergonomics could be an issue on the road. I've traveled with the Yoga 720 15" overseas and I bring it with me to work every day. I just throw it in my bag and go. No issues yet. The Microsoft Surface Pro is much more expensive with an equivalent feature-set, a bit too small for photo editing and it's hard to sit it in your lap comfortably. The Yoga allows me to use a good-sized keyboard with good key travel, I can use it in my lap comfortably and I can flip it over if I want to draw on the screen, or use it as a tablet. No, you can't throw it into the ground from five feed up and expect it to survive, but most notebooks wouldn't. It has an aluminum body much like a Mac book pro, so it's strong enough, but may dent if you hit it hard enough. When I was deciding on notebooks for photo editing, I considered them all. I even went ahead and bought a gaming notebook thinking it would be perfect. Turns out the screen was terrible and not very color-accurate. Even though I wanted to love it, I had to return it. That's when I decided to run to a local Best Buy store to check out all the different notebooks and compare screen quality. The Yoga 720 jumped out at me as soon as I saw it. It rivaled the Mac book pro and nothing else in store looked better. I wasn't planning on buying anything, just looking around in-person, but ended up getting it right then and there. Have been happy with it ever since! So... I would definitely recommend you go look around in person. What's perfect for me may not be perfect for you, but I don't know why not. I went to Best Buy to check out what they had available. I like to get a feel for the keyboard and screen before I buy. The Yoga was a lot more comfortable to use than I would have expected for a convertible system. The screen was nice. and although the keyboard is somewhat flat, I found that I could touch type on it without a lot of errors. I have used compact systems before and they have really slowed me down since the keys aren't where my fingers think they should be. I also tried the Microsoft Surface Pro notebook but I don't think it has anything better than the Yoga. The 15" version was over $1000 more than the Yoga I would want and it didn't have a 4K display. I'm not sure why it is so much more expensive, but I won't be getting one. Best Buy really didn't have anything else I would consider for post processing. Well, they had plenty of Apple, but I'm not going there. I will probably try to find some other places where I might be able to see Dell or Lenovo, maybe even HP laptops. Even if not equipped the way I want if they are from the same line I will get an idea of the ergonomics. I have to say that the Yoga is a contender. I haven't looked in a while, but it used to be that convertibles were lightweights in performance as well as being physically light. This one is a powerhouse. I agree that it did seem physically solid as well. Maybe a little heavy to use as an ereader or tablet (I have a Samsung Galaxy Tab S 10.5") but they aren't computers either. Thanks @Richard and @Dyun for your responses. Now I just have to look around and decide. I'm not in a rush yet unless my desktop completely quits. But I do like to do the homework before making a purchase that I will have to live with for a while. Awesome. I hope you find something that will make you happy. Just saw this and thought I'd post it here in case you want to check this one out as well: ASUS ZenBook Pro 15 UX550GD It was just announced last month (May 2018) and has a 4K touch screen with 100% Adobe RGB. It seems to have similar specs as the Yoga 720 15". https://www.asus.com/Laptops/ASUS-ZenBook-Pro-15-UX550GD/ No idea on the price. Doesn't seem to be listed for sale anywhere yet, but maybe you'd like to keep an eye out for it. Thanks @Dyun. I currently have an ASUS laptop and I previously had one of their net books (10" laptop before there were tablets). Both have been reliable, so I will probably check this one out as well. It looks really impressive though I'm not sure I need that i9 processor . I checked the Dell outlet also and I can get an XPS 15 (new, not a refurb) equipped similarly to the Yoga 730 except the processor is the 7th generation i7. Price for the two is about the same, using the current sale price for the Yoga. I am familiar with that Dell since I used them at work. I have owned two Dell desktops and they were reliable as well. Lenovo reliability is also excellent and the ones I tried at Best Buy seemed to have good ergonomics. So I have some good options so far. I've traveled with the Yoga 720 15" overseas and I bring it with me to work every day. How's the keyboard on this one? I have a Lenovo LaVie I bought a couple of years ago for international travel. It weighs 2 lbs. Runs LR and PS OK. Keyboard is basically unusable. Lousy tactile feel and non-standard key placement will drive you nuts. If I used the webcam much I would have to think about the odd location in the Dell XPS. But I've turned mine on accidentally more than I have used it so I guess it's OK. I was concerned that the description didn't specify an IPS display, but it is listed as IPS on the "Product Details" tab at the above link. I was looking at a similarly equipped computer in the Dell outlet for about $150 less (new, not a refurb), but that one must have sped out of there since there are no equivalent laptops in the outlet now. I haven't had any issues with the keyboard on the Yoga at all. I like it. Enough key travel, big enough to be able to type no problem. I used to use a 17" ASUS laptop that had a full keyboard and it only took me a few minutes to adjust to the slightly smaller keyboard of the Yoga. Ok, I picked up a Dell XPS 13" at Costco for $1400. I'm in love with it. So light and compact, smoking fast, absolutely gorgeous display, lighted keyboard with great tactile feel. It even looks cool. It's got face recognition, so I just walk up to it and it unlocks. (May be old hat for some folks, but new to me.) I didn't think I had any use for the touch screen, but boy was I wrong. It's really addicting, and they really thought through the UI. And windows 10 works perfectly with the 4K display. I'm running a 4K monitor under Windows 7 on my desktop and it's got all sorts of issues. Anyway, I'm loving this laptop. How is the 13" display for post? I think I could handle using a 15" but I'm not sure about the 13". That's a pretty good deal though and is very tempting. The online price of the 15" I was looking at went up $300, so it's $2050 after applying the coupon ($250 off systems over $1999). It has a 1TB SSD but is otherwise equipped the same as yours @kdog. I don't know if it has face recognition. I like it! It's not like working on my 31" 4K monitor at home but totally usable for me when I'm traveling. My previous laptop was a 13" Lenovo LaVie, so I knew what I was getting into in this monitor size. But I love the tiny size of it. Plus it's super light, 2.6 lbs. Windows 10 added a new graphics settings for controlling the scaling factor of the display that I'm assuming was put there for super-hi res monitors like 4K. It basically says how many pixels of the actual monitor to map to a single application pixel. The lowest setting is 100%, which is a 1:1 mapping. So there's tons of room on the screen but everything is tiny. Increasing the scaling factor makes everything bigger so you can see it more easily, but you get less stuff on the screen. At 300% which is the default, I can edit on this laptop without reading glasses. But then I can decrease scaling and put on my reading glasses and have tons of room for the picture display and editing controls. I've run both Premier and LightRoom, and they work perfectly in this environment. Thanks. I still haven't decided which size to go with, but hearing that it is possible to use the 13" is useful. I once used a 10.5" net book while traveling on business, but never for photo editing. Spreadsheets were difficult enough and the keyboard was cramped. But it was light--about the only good thing about it. That was quite a while ago. Mostly I will be traveling by car so the 15" should be OK, but the light weight makes the 13" tempting and I do hope to take a few overseas trips. Time to do some side by side comparisons. Well, I still haven't taken the plunge but I may be getting closer. I have been considering the XPS 13 but since this will be my only computer I am concerned about just having the integrated graphics. 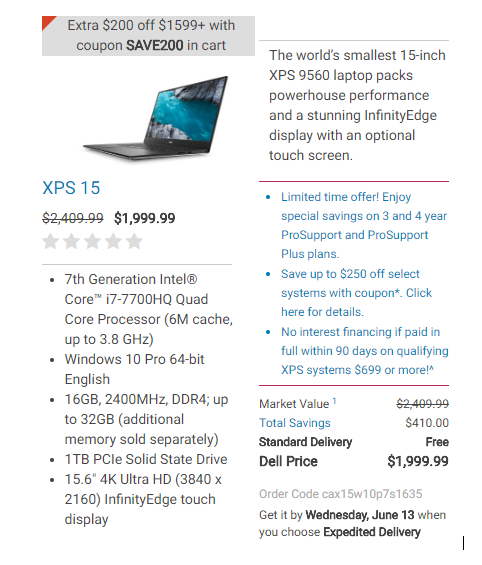 Also, a Costco special on the XPS 15 seems to have a lot more bang for the buck ($1849 in case the price doesn't show if you're not logged in to Costco). But the 15 is a couple of pounds heavier than the 13. That makes a difference as I get older and lug around almost 5 pounds of laptop in addition to camera gear. Today's integrated graphics are probably better than the card in my 10 year old desktop though, so maybe I wouldn't be giving up much with the 13. AND, I just checked the Costco holiday flyer and saw that the 1 TB SSD, 16 GB memory XPS 13 will be on sale on 11/22 (one day only, online only) for $1499.99. I think it would be this one, but the item number for the sale price is different. So, I'm still on the fence--for a few more days anyway. But I will have to replace my desktop soon. In addition to what I believe is a failing fan, I apparently took an electrical surge (despite a Belkin suppressor that still says it is protecting) and lost the ethernet card in my computer along with my cable modem and router. Also a cordless phone system, LED lamp, and garage door opener... My laptop was also plugged into a suppressor and it seems to be fine. My recent backup to an external drive was completely unplugged so my data was not at risk. I'm using a USB2 to ethernet converter for my desktop but it's sloooowww. It looks as if the XPS 13 only has USB C inputs so I would have to get a hub or converter to use my existing USB devices but that's not too big an issue. But I may want to update my monitor also for when I'm not traveling. I'm currently using a 2012 Dell U2412M. It isn't giving me any problems but it's behind the times now. Given these choices, does anyone have any comments or recommendations? Thanks. I'm sure you'd be happy with either one. Me, I've very happy to have the tiny 13" for traveling, but I have a desktop PC for home use. Of course if you're using an external monitor then maybe the 13" is fine for home use. Is the keyboard bigger on the 15? Maybe that's a consideration. Although I'm guessing you can use an external keyboard with the 13" if necessary. Not sure you'll notice much performance difference, the 13" is already pretty snappy. But again, it's hard to make a wrong choice here. By the time I logged onto Costco.com on Thursday the XPS 13 one day deal was sold out. So I "settled" on the same computer with a 512 GB SSD instead of the 1 TB SSD. But it also includes one year of Office 365 and is $150 less. So, I don't think I did too badly all in all. Nice! I think you're going to love it.